Just about the entire northern hemisphere is in the grip of a prolonged heatwave, with wildfires raging and people dying. There’s disagreement on how much climate change is to blame, but a consensus that damaging heatwaves will become more frequent, and we really ought to do some planning for that now – changing the way that houses are built, and planting (and retaining) more trees and green spaces, for a start. Personally, I don’t do at all well in the heat. This week I have almost become a hermit, venturing outside only when entirely necessary. Ryan and I take it in turns to water the garden in the evening, and that’s pretty much all the attention it’s getting. I planted up a bed or basil and parsley on 11th July, and have just managed to keep some of the plants alive – one or two even look like they might be getting the hang of life now – but I have some climbing pea seedlings that really want to be planted out, but would scorch in about 5 seconds. These #Sentinel 2b images clearly show the effects of the hot summer #weather we've been experiencing at our site @HarwellCampus in Oxfordshire. So I am staying indoors, and this week I have been reading Tim Peake’s Ask an Astronaut: My Guide to Life in Space, and in some ways our current situation is a bit like life on the ISS. The harsh exterior environment means it’s unwise to nip outside without proper preparation, and we’re all forced to keep wearing a limited set of clothes (although, unlike ISS astronauts, we can at least wash ours and get them dry!). All air movement is being forced by fans, I don’t feel much like eating, and while I have more cooking facilities than an astronaut, I certainly don’t feel like using them much, and we have been quite reliant on food that comes in packets. I wonder how Tim felt, stuck inside the ISS, because by his own admission he’s an outdoorsy kind of person, and a lot of his expeditions have been to nice cold places. It’s one thing to spend a few days in a confined environment, it’s quite another to sign up for 6 months in which any reminders of life on Earth have been delivered by a rocket. In the book, Tim answers quite a lot of questions about what the food is like on the ISS. He has a tendency to put a positive spin on everything, but I can image that – a lot of the time – it’s a big grim. Astronauts are always thrilled when a supply ship arrives and delivers fresh produce – usually fruit – which has to be devoured in days. One of the treats Tim talks about fondly is the ‘maple-top muffin’, which is a pre-packaged MRE (Meal, Ready to Eat) included in military rations, with a long shelf-life. When I Googled it I couldn’t find a recipe (and probably wouldn’t be able to recreate it anyway), but I did find one for maple-glazed blueberry muffins, and with a sudden fit of enthusiasm I thought I would make an astronaut-inspired dinner. The main course was easy – astronaut hotdogs with sausages wrapped in tortillas (crumbly bread is a no-no in space) with a splurge of condiment for extra flavour. Preheat the oven to 180°C/160°C fan/gas 4. Mix together the flour, baking powder, bicarbonate of soda and sugar. Separately, mix together the melted butter, milk, eggs, maple syrup and vanilla extract. Then pour the wet ingredients in with the dry, throw in the blueberries and gently mix everything together. Muffins don’t like to be over-mixed, it makes them heavy. Hot weather listless stirring is perfect! Spoon the mixture muffin cases, then bake for 22-25 minutes until they’re nicely risen, golden brown and a skewer inserted into the centre of the largest one comes out clean. Transfer them to a wire rack to cool down a bit, but don’t leave them too long, as they’re most delicious warm! Make the maple glaze by combining the remaining maple syrup with the icing sugar. Exclaim at how little there is, and wonder how you’ll spread it over 12 muffins. Go to plan B – spread the maple glaze over 4 muffins, top each one with a blueberry or two, and then scoff two each. You can make more maple glaze later on when you want to eat the rest. 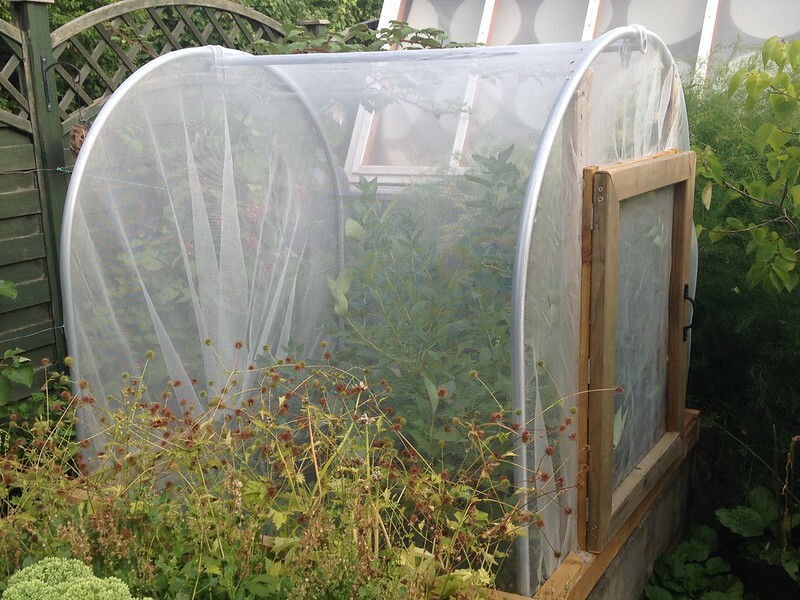 For those of you who like space stuff, I have a new Twitter account – @emma_astro where I’m posting my space food/gardening and more sciency stuff, whilst I continue transmitting the more Earthly gardening and botany via my normal channel (@emmathegardener). Great work! Your post is both entertaining and informative which I really like. 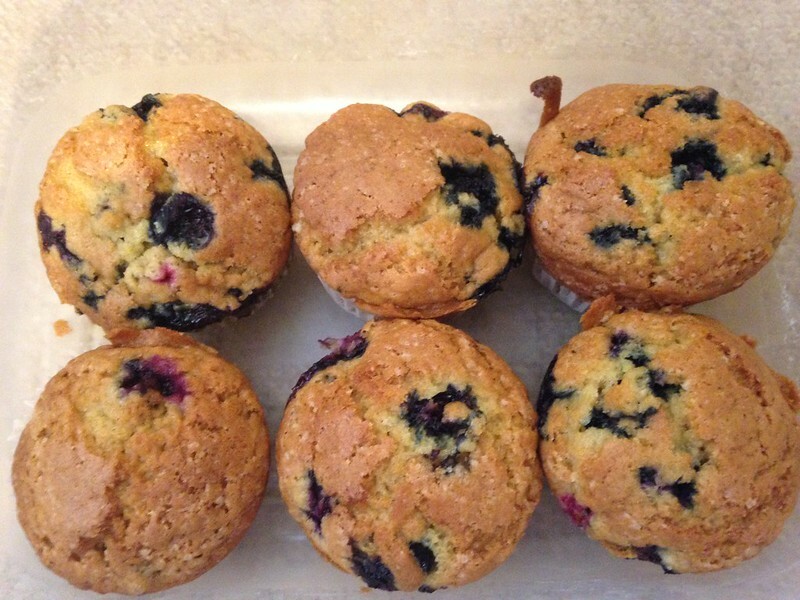 Thank you for sharing your recipe, now I’m also craving for some blueberry muffins :D. I’ll go ahead and pick some now so I can enjoy these tasty treats later in the afternoon. Yum! Thanks Maggie 🙂 We’ve had a second batch since I wrote this post, but made them with Japanese wineberries and not blueberries. They were equally nice!